Ack! The holiday shopping season is upon us! What is your shopping strategy for this time of year? Do you spread out your shopping over weeks and months, or try to get it all done at once? Do you mostly shop online or in person? How heavily, if at all, do you rely on gift cards, gift certificates or plain old fashioned cash and checks? Extra Credit: Do you enjoy shopping the Black Friday and after-Christmas sales? Um, I haven't started yet. This is not unusual for me. It's not that I hate to shop, but I have limited patience with lines, and even more limited funds to spend. I'm not likely to get in line to buy anyone a new tv or computer at a deep discount. The only person I can afford to spend significant money on these days is my husband, and frankly we have a history of returning his "big present" to Best Buy (or wherever) immediately after Christmas or his birthday. We do this almost every year, it seems. Even more limited in supply is my fund of ideas for what to get anyone. As you can tell from the above, shopping for John is a perennial problem. He tends to just buy what he wants. If he doesn't buy it, it means he doesn't think we should spend the money. For many years, my dad organized Christmas lists, so that we all knew what other family members wanted and could share out gift ideas for each family member to buy; but even he has pretty much given up on this now. He sends a check, and I send Amazon gift certificates, to just about everybody. Or Borders or Barnes and Noble gift cards. Same thing, really, just in person. A gift from me to me: sandals that fit! So, no standing in line at Best Buy at 4:45 AM, as an old classmate of mine documented on Facebook Friday morning with a photo of a Best Buy line in Binghamton, NY. No turning in at Park Place Mall. I did want to participate in a push to buy local on Saturday, but I forgot. Nevertheless I managed it, by accident. Michael of Michael's Shoes, who is also the deacon at St. Michael's, coincidentally enough, is having a sale at his store. Since his store was the source of the only decent shoes I've bought in the past decade for my large, flat, pain-prone feet, I decided it was a good idea to get another pair while I could get them, especially at a substantial discount. So I walked in yesterday and said, "Show me anything you have in stock that's likely to fit and not hurt my feet!" 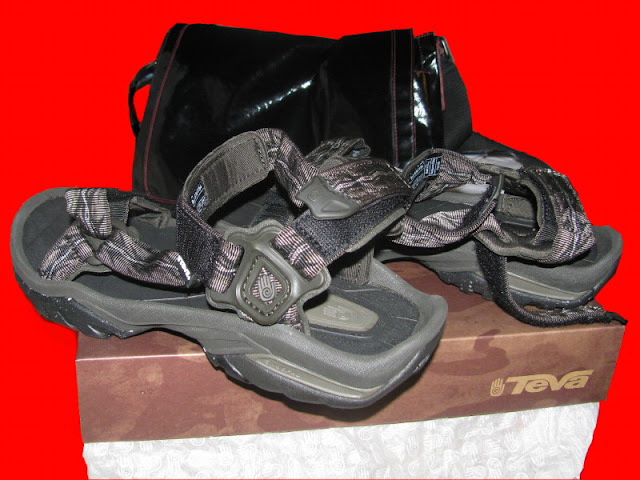 Most of what they brought out was either too masculine or not right for the shape of my feet; but I got a nice and non-pain-inducing pair of sandals, probably the first pair I've had since college, if not high school. Okay, so it's a present from me to me, but I did buy local, on the big shopping weekend! Still, I'm working up my plans and ideas. I have established that John doesn't want me to buy him an iPad, except possibly after I get the job I applied for last week. (More on this if anything comes of it.) On the other hand, he has mentioned a few things in passing, mostly housewares. I'll have to look into those possibilities. Given that my unemployment benefits are currently under threat by Republicans in Congress, I'm going to have to wait to see whether I can send friends and family the usual Amazon gifts, and how much. There is one exception to this calculation, though. A friend of mine Back East, with whom I've been exchanging birthday and holiday gifts for three decades, was burned out of his home a few weeks ago when his landlord's apartment, which was below his, caught fire. Because it rained the following night, his apartment was so structurally unsound that he couldn't even go back in for the few possessions that survived. He's hoping to use Amazon to replace a few favorite books, and I'll be supplementing that with a few mathoms. I wish I could do more, but he's the sort of person who is embarrassed if anyone does anything in a situation like this! Here are the guidelines if you'd like to participate in this week's Weekend Assignment. 1. Please post your response no later than than 12:01 AM on Thursday morning, December 2nd, your local time. You can do this either in a blog entry of your own or in the comments section of the assignment entry. No submissions will be accepted after that time unless I really want to. 2. 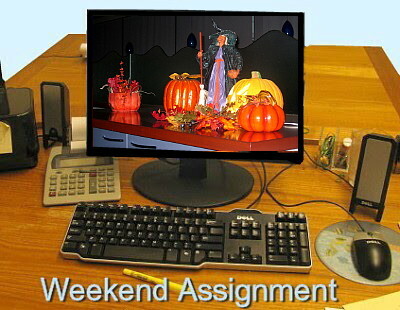 Please mention the Weekend Assignment in your blog post, and include a link back to the original entry. 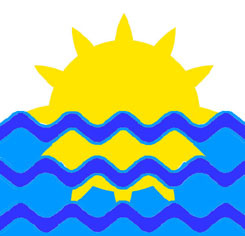 Using one of the logos shown here is encouraged but not mandatory. 3. Please come back here after you've posted, and leave a link to your entry in the comments to the assignment. Please post the URL itself rather than a live link. 5. I'm always looking for topic ideas. Please see the "Teacher's Lounge" page for details. If I use your idea, you will be credited as that week's "guest professor." Help me out, folks, because sometimes I run dry when doing this week after week! 6. I reserve the right to remove rude or unpleasant comments (not to mention comment spam), and to leave entries off the linking list if the person has been rude or unpleasant, or fails to mention the Weekend Assignment in the entry. That's it for now. I realize it's a busy time of year, but please jump in with an entry if you can. Have a great week! I'll be back Friday night with my Round Robin entry. Thanksgiving is upon us, the time of year when we're asked what we're thankful for. Let's take the opportunity to interpret this literally, and actually thank someone! Tell us about someone in your life, past or present, whom you would like to thank for what they did, and why. 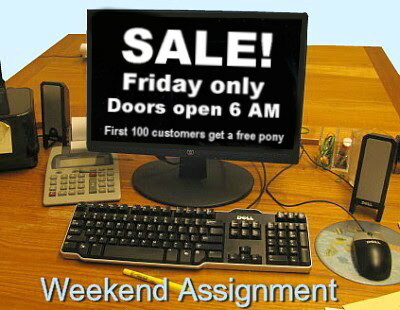 Extra Credit: Suggest a Weekend Assignment topic, because I'm running dry! Also: would you prefer that the topics be mostly literary, or is a variety better? I've been thinking all week about who I'd like to thank. John? 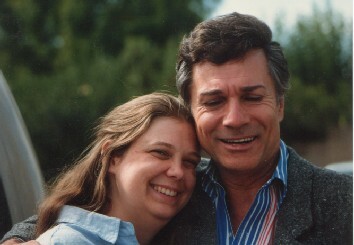 One or both of my parents? My brother, who used to cheer me up when my parents argued across the hall from my room? Some teacher? A writer? An actor? A politician? 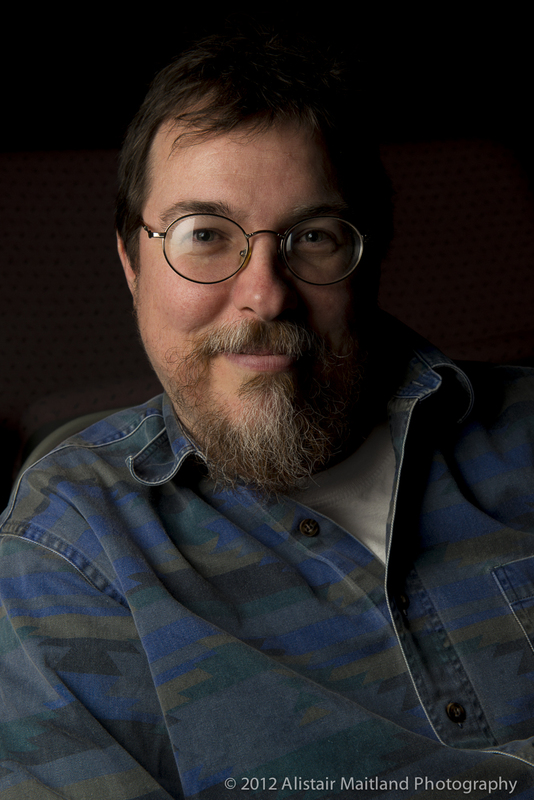 Well, of course I'm thankful to John, my husband and beat friend for the last 31 1/2 years; but an entry in tribute to him would be tricky for me to write, and embarrassing to him rather than gratifying.I've written entries about each of my parents, my brother and at least one writer. As for politicians, well, even the best of them can be a disappointment. No, I think I'd better go with thanking the people of the Episcopal Parish of St. Michael and All Angels. Don't worry; I'm not here to convert you or anything. My first visit to St. Michael's was sometime around 1997. I hadn't been to a church in years, on the theory that until I knew what I believed it didn't make sense to go to church and mouth words with which I disagreed. I was a lapsed Catholic, sort of raised to be a lapsed Catholic because my mom had been deeply ambivalent about the Church since long before I was born. But I was reading religious nonfiction by Madeleine L'Engle, and coming to realize that I'd never come to any decisions about religion without making the slightest effort in that direction. L'Engle was an Episcopalian, as was a friend of mine from my high school and college years. It seemed like a pretty benign denomination, most of the good stuff about the Roman Catholic Church without any of that pesky conservatism about birth control which drove my mom away in the 1940s. The first female Episcopal priest (I think) was at Syracuse University, an innovation that counted in its favor. And conveniently, there was an Episcopal Church just a few miles up Wilmot from me. It had a sign out front, "Jesus was a refugee." I liked that. So I worked up the nerve and went to church there one Sunday. Two things happened that first day. One, I found that the Mass, albeit tricky to follow because it involved switching back and forth between two books and a leaflet, was close enough to the ritual I'd grown up with to be comfortingly familiar. Two, and more important, two different people from the parish took it upon themselves to greet me and introduce themselves. One was a parishioner about my own age, Suzanne. The other was the rector, Father John Smith. He'd been at St. Michael's for about a year. Buoyed by this welcome, I returned the next week, and the week after, and on and on. Not that I'm just a parishioner. One year, Father Smith called for volunteers to help with Mass, as acolytes (what I used to call "altar boys" growing up) and as lectors (readers of the Bible lesson for each week). I signed up for both. Through that, I made the acquaintance of Proscovia King, the Master of Ceremonies who trains and directs the acolytes and helps out at very nearly all the masses. Born in Africa, Proscovia grew up in England, where her mother was chief acolyte at Canterbury, I believe. I also became friendly with other acolytes, from high school students to University professors and staff. In 2004, Father Smith started taking about the parish being on BlogSpot. I didn't quite know what that was yet, and when I asked about it, he put me in charge of the thing. From there it was a short step to becoming the parish webmaster. At the same time, I started to get into digital photography, and was soon taking pictures of major church functions to post online. This brought me in contact with other parishioners as well. Somewhere in there, my friend Kevin started riding to church with me, and we started to develop a small circle of friends who usually sat together at Coffee Hour after mass. For somebody like me who doesn't socialize much, this was a big deal! But my integration into the life of the parish and its people took a big leap forward at the beginning of 2009. My job at First Magnus was long over, I'd been laid off at Beaudry and at that time lacked even a temp job, except for four disastrous days in January as a tax accountant inside a check cashing store in which nefarious things were taking place. An auditor had called for the parish to bring in a second bookkeeper to make the weekely deposit. Was I interested in the job? Well yes, of course! So bookkeeper Pat Strawn and Parish administrator Nancy Vernon showed me the ropes, and I put in a few hours a week at the church office. When Pat quit at the end of June, I took her place as parish bookkeeper. On paper it was a step down from my various staff accountant jobs, but for me it was a godsend. I was making a little money to keep my unemployment from running out as quickly, it gave me nonprofit accounting experience for my resume and I had a place to go in the afternoons. Just as important, though, I was even more a part of this community. 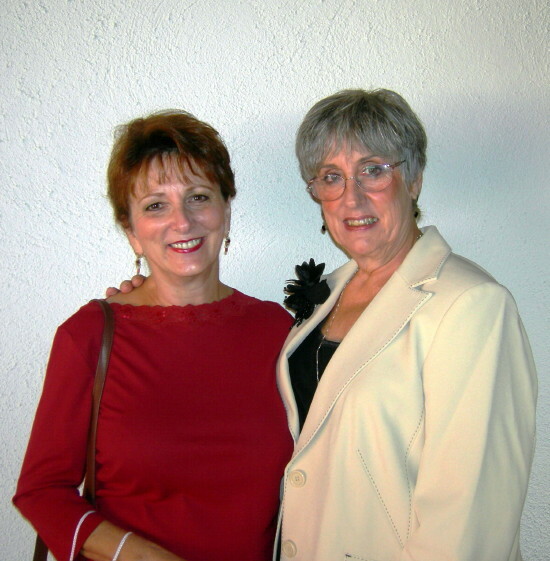 The two parish administrators, Alicia Basemann and Nancy Vernon, became my friends and confidantes, and I saw a bit more of Father Smith, whom I admire. Pat Miller replaced me on the weekly deposits, so I got to work with her as well. The parish has a number of volunteers, also, many of whom answer phones in the church office, prepare food bags for the poor and so on. Nearly all of them are twenty or thirty years my senior, but I've gotten to know each of them a bit as well. Between carrying a candle or a cross in church, taking pictures, hanging out at coffee hour, doing the books and attending vestry meetings, I've become a rather well-known character at St. Michael's, and in turn have learned the names of many of the other parishioners and a little bit about some of their lives. I feel welcomed, appreciated. I'm part of something, a community with common purpose, not just worshipping God and drinking coffee together, but helping the poor, fighting for social justice and so on. It's not really within my character to go out on protests or travel to Guatemala with Ila Abernathy to help displaced Mayans, but I'm very proud to be at least tangentially associated with such activities. So thank you, people of St. Michael's. Thank you, Father John and Father Ed, Nancy, Alicia and Pat, Ila, Les and Jim, another Les and another Jim, Jan and Mary and Kevin. Thank you, Proscovia, Jane and Toni Sue, Jo and Mike and the other Mike, Margaret and the other Margaret, and the lady whose name I can never remember but her son wrote a book about a Muslim boy who loves the Statue of Liberty. Thank you, Frances and another Mary, Robin and Al and Bob, and lots of other people I could name if this list weren't too long already. You've all enriched my life, and I'm very thankful for you all. Ack! It's time to show my colors! Although she doesn't remember it, this week's Round Robin topic, Colorblind, was suggested by Nancy of Nancy Luvs Pix, three years ago this month. I've been wanting to do this Challenge (Basically, take a photo of something, change the color...make it interesting!) for a long time. This is something I really enjoy doing, taking a fairly ordinary picture and making it surreal (or at least more colorful) by playing with the color settings in my cheap photo editing program, PhotoStudio. 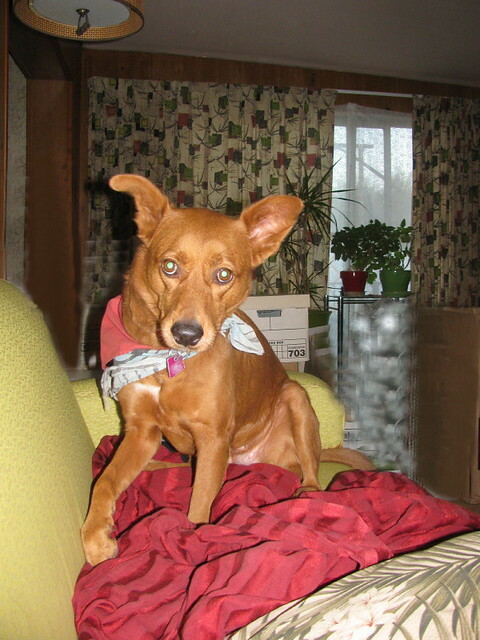 This shot of Cayenne has had no color adjustment. 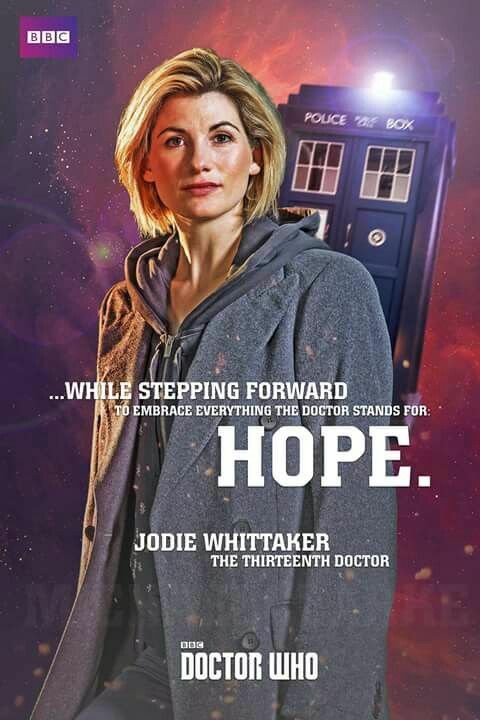 I did, however, take the liberty of cloning out some of the boxes and stuff behind her - rather unconvincingly I might add! 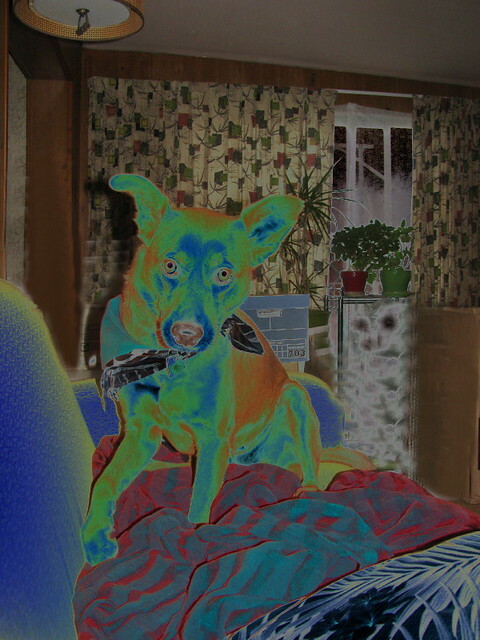 Same photo, negative image. 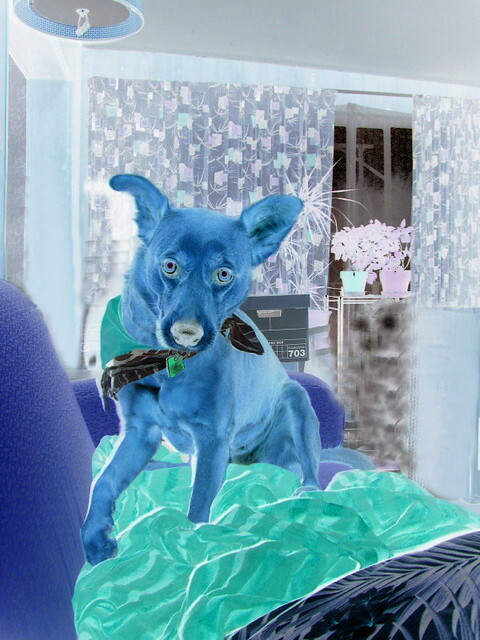 Is Cayenne a Blue Dog Democrat? 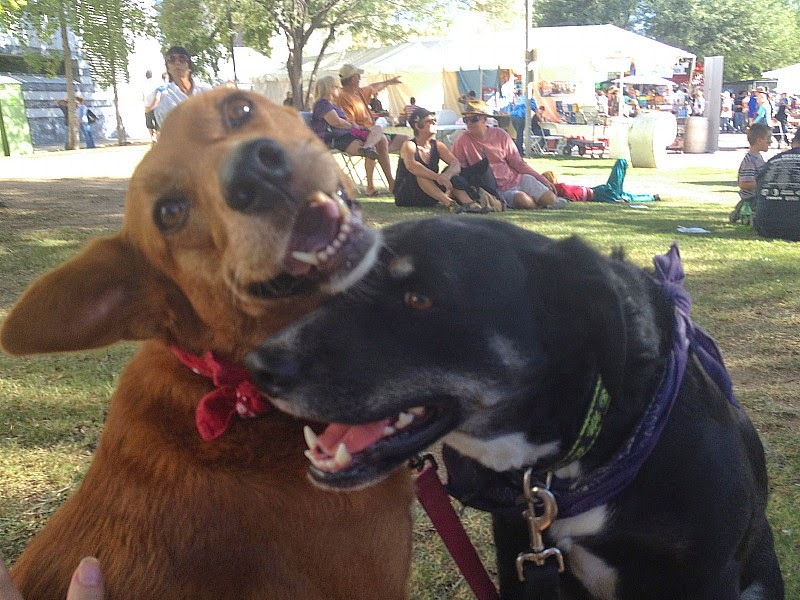 I betcha five dollars she's a good dog too! Same image, solarization effect, I think on top of the negative one. The backgound has reverted, but Cayenne will never look the same again - not in this photo, anyway. I also have a "dark marker" effect version if you're interested. I've increased the saturation on this Oro Valley sunset, and shifted the hue a bit. Result: the colors are brighter and just subtly "off." Last one. 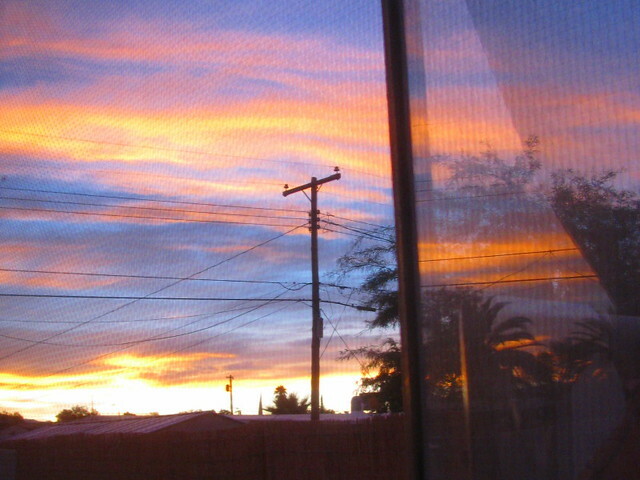 This October sunrise, as seen through my bedroom window, has been saturated a little, but is not far off what my eyes saw that morning. 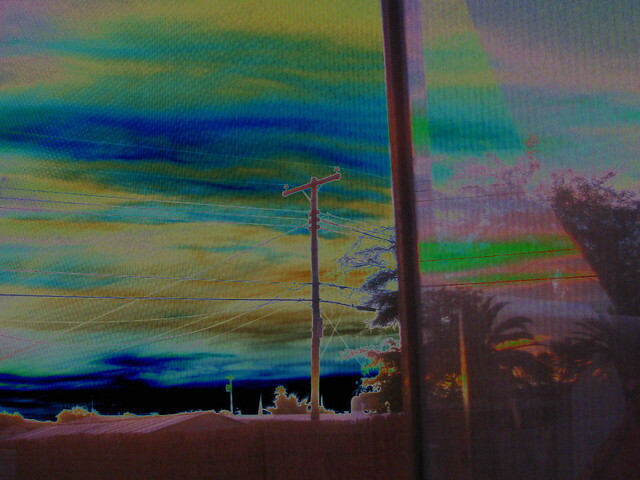 But I think the solarized version is more interesting! Now let's see the other Robins' oddly colorful photos! Time to answer my own question! Extra Credit: What do you like least about this time of year? For me it's sort of all of the above. Except for the autumn leaves part. Tucson trees do very little color-changing. It just isn't cold enough for that, and we have the wrong kinds of trees. 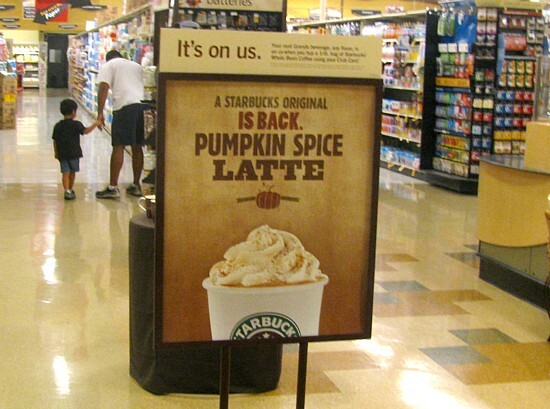 First off, autumn is my annual chance to pursue my "pumpkin anything" obsession. Pumpkin bread, ice cream, yogurt (frozen and otherwise), butter, pies, tarts, cookies, and variations on most of the above have all passed my lips at some point in recent years. Last weekend I combined the remains of my pumpkin steamer from the Starbucks counter at Safeway with a small vanilla shake from Whataburger, and made myself a pumpkin shake. It was good, too. Overall, though, I haven't indulged in much Pumpkin Anything this year. Second, and probably more important to me, the weather from October to April is half the reason John and I moved to Tucson nearly a quarter century ago. This year, October was still quite warm, with an average high of 86 degrees and two days breaking the 100 degree mark. Still, that was a big improvement over September! It's also a big improvement over the Octobers I grew up with in Manlius NY, and later in Syracuse. It nearly always snowed before October was over, but the real misery of autumn in Central New York was all the dark, rainy days and nights, especially if the windchill kicked in as the cold weather roared across the Great Lakes Ontario and Erie. Yuck. It was well worth giving up autumn leaves to leave behind all that rain and snow. What little rain we get in Tucson mostly happens at predictable times, like 5 PM on a summer afternoon when it is mostly a relief! Here in Tucson, November has been very pleasant. It's cool enough that we were finally able to stop running the air conditioning, but not so chilly as to require us to turn on the heat. There have been a few mornings when I probably would have benefited from wearing a light sweater, but some days I've still been in my short sleeved tops, and quite comfortable. It's great sleeping weather, with a blanket and a few dogs to stave off the chill. The third cool thing about autumn in Tucson, for me, is a handful of holiday and holy day celebrations, and I don't just mean Halloween. As the church year winds down, St. Michael's celebrates the Feast of St. Michael and All Angels, otherwise known as Michaelmas. This year that included the English Faire to which John and I donated so much stuff, but there was also a special mass with extra musicians to accompany the choir. 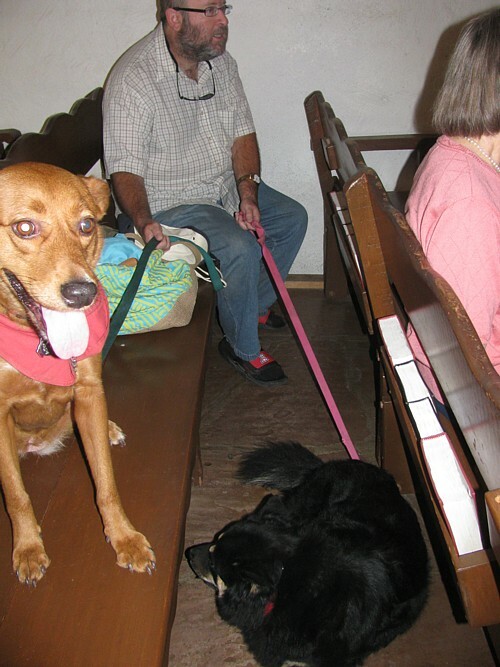 A week later was the Feast of St. Francis, featuring the Blessing of the Animals. Someday I'll get a decent picture of Cayenne and Pepper getting blessed, but it's touch to lead them up to the priest, get them to stand still, and take their picture at the same time! And yes, there is Halloween, and the Días de los Muertos celebration, Mexico's Day of the Dead, which is enthusiastically celebrated in Tucson. There's a very unusual parade downtown, and candy skulls and really amazing folk art skeletons. I've never gotten out to see any of this, but one of these years I will. Mostly I've seen it as decor in a few shops, but St. Michael's had a Días de los Muertos table in the back of the church this year, part of the Anglican Feast of All Souls. Same thing, just celebrated differently. The Church year is kind of an odd thing anyway. It begins and ends in late November, when Ordinary Time gives way to Advent, the four weeks leading up to Christmas. In other words, it starts about two thirds of the way through Autumn! This year I have a selfish reason to look forward to Advent. As fat as I am, I have had an ongoing problem every Advent and every Lent when serving at Mass. When everyone else switched to different vestments appropriate to those liturgical seasons, I struggled. None of the red cassocks the parish has for Advent fit me at all, and largest of the black ones for Lent I can only get into if I get pinned in instead of buttoning, and try to hid the fact that it's not shut under a white garment called a surplice. Unsurprisingly, I find this extremely frustrating and embarrassing. Most of the time I just end up in my usual white alb, which does fit, but in those seasons fails to match what anyone else is wearing. But the new church year, which starts in a couple of weeks, will mark a major change in my difficult relationship with liturgical garments. Having ordered red and black cassocks from two catalogs, only to return them when they didn't fit, we decided, with the rector's permission, to have red and black cassocks made to measure for me. 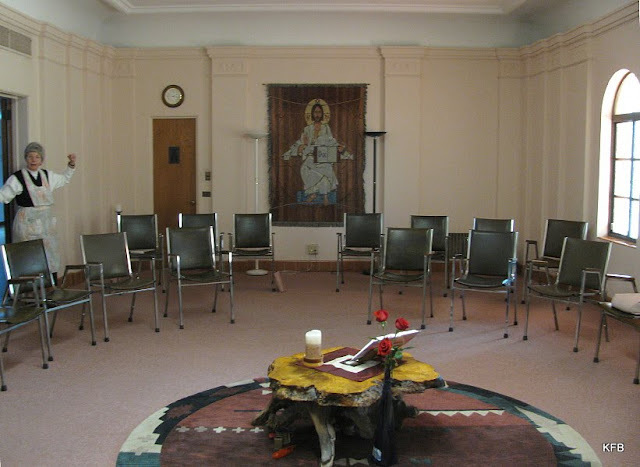 This is being done at the Benedictine Sanctuary of Perpetual Adoration, the distinctive monastery on Country Club Road that I have photographed before. 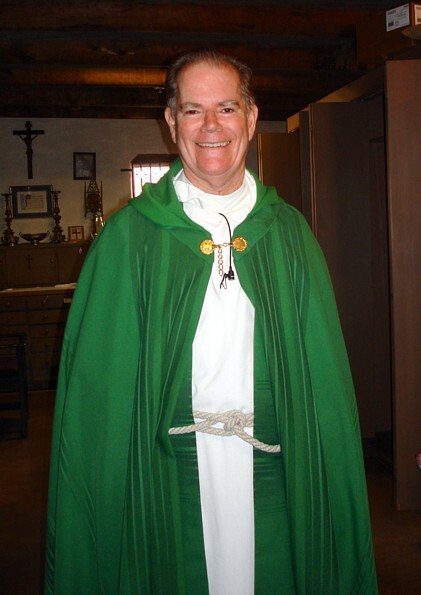 Sister Joy Ann and a few of her colleagues comprise the Liturgical Garments Department, which makes ritual clothing for priests, nuns, deacons and acolytes all over the country, but especially Arizona. After extensive measurements were taken, I went off to Hancock Fabrics and bought the yards of red and black cloth, for which I was reimbursed, and brought them to Sister Joy Ann. She then worked out how many buttons I needed to get, 14 for each cassock. I got them 5 to a card, half off of $1 a card, so that was a great deal. Last week I got a call to go over for a fitting. Rather than risk messing up the red cloth with guesswork for this patternless project, Sister had cut a partial garment from an old sheet, pinned together so she could made adjustments. Afterward she gave me a brief tour of the beautiful old building. The monastery portion of the building. More photos at My Tucson. 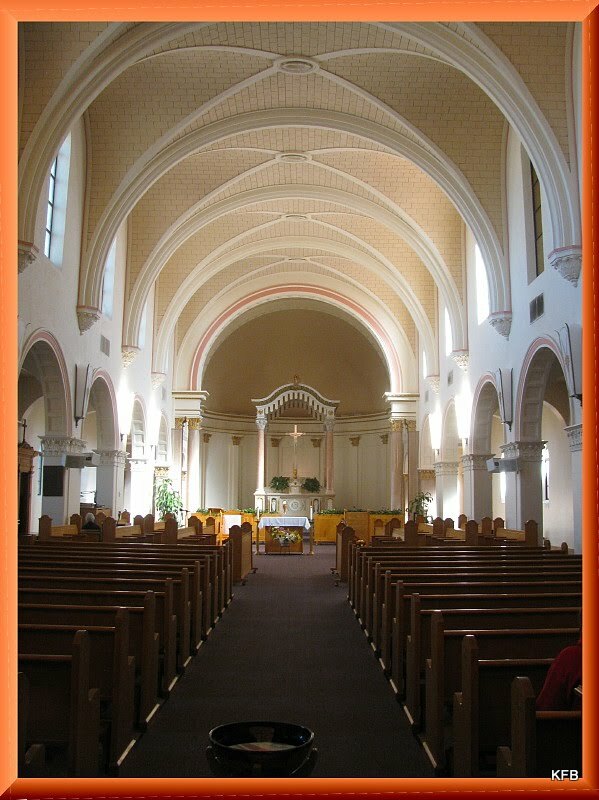 Like a number of major Tucson landmarks, the monastery was designed by architect Roy Place, whose classics-inspired buildings are a big part of Tucson's distinctiveness. This is probably one of his very best works. 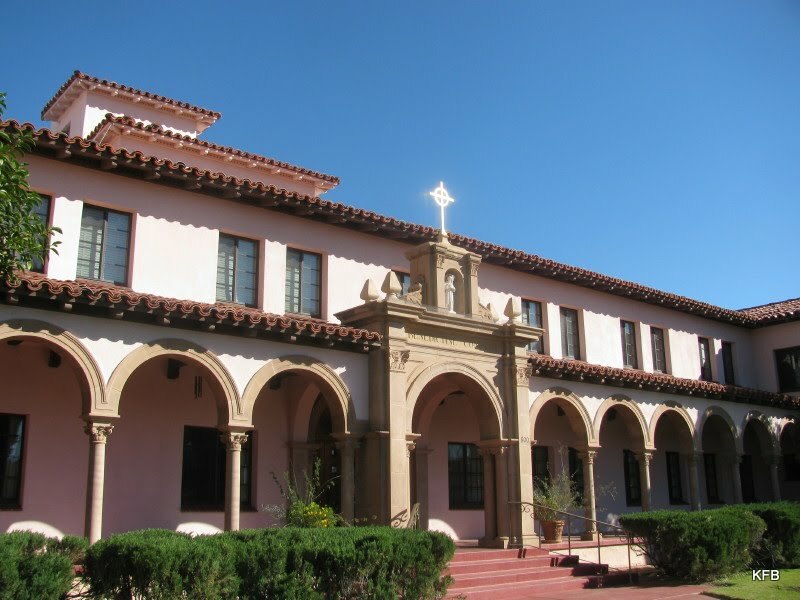 November 2010 marks 75 years since the Benedictine Sisters arrived in Tucson, and 71 years since the groundbreaking on the current building. I just missed the open house, but there's a big anniversary celebration a week from Sunday. 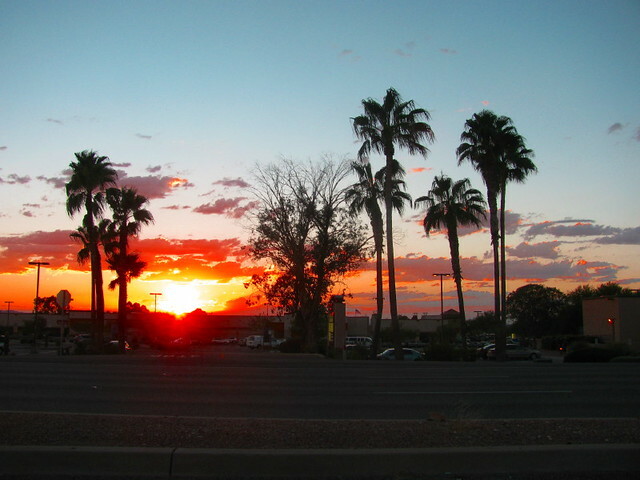 So you see, that's another cool thing Tucson has in the fall! Let's see; what have I been rereading lately? Some people like to read a book once, and then they're done. The plot is resolved and they know whodunnit, so it's time to move on to the next book. Other people reread a favorite book every few years, and still others keep it on their shelves in case they may want to read it again someday. Are you a frequent re-reader, an occasional one, or are you "one and done"? 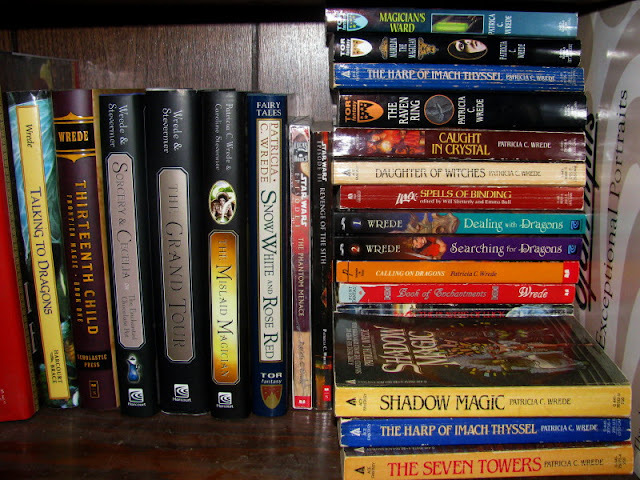 How do you decide what to reread, and when? Extra Credit: What was the book you reread most recently? I'm a little embarrassed to admit it, but I'm a lifelong re-reader. On the one hand, that means that the books I buy are not a waste. Once I buy a book, I am almost certain to read it more than once, probably three or more times over a period of decades. In fact, aside from a basic collector's mania, that's why I buy all the books I read, and have borrowed a total of one book (I think) from a library in the past two decades. I figure, if it's worth reading, it's worth owning, so that I can read it again at a moment's notice. I mean, really! If I'm thinking about the Harper Hall Trilogy at three in the morning, I can go right to the shelf my Pern books are on, and start reading it again. Well, actually, I think the Pern books are in a box at the moment because I pulled them from my closet to put in the library. But the point stands. But with a world full of books, a large subset of which are fantasy and sf and other stuff I might enjoy, why do I read a few hundred books over and over instead of sampling the whole range of what's available? This is where the embarrassment comes in, because the truth is, I'm not all that well read. A friend asks me what I think of Neal Stephenson or China Miéville, or recommends Charles de Lint or whoever, and I have to admit I haven't read anything by them. Heck, on our first date on New Year's Eve 1985-6, my last boyfriend before I met John bought me Dune and ordered me to read it. Later he also told me to read some Zelazny. I never did it, just as I never read David Copperfield, more because my mom kept saying that I should than because of any distaste for Dickens. When it comes to trying new authors, I am debilitatingly resk-averse. So when I do find a writer whose work I enjoy, I tend to go overboard. I have over six feet of Madeleine L'Engle books, collected over the past 35 years. I have all of her novels, a reasonable chunk of her memoirs and religious essays, and some of her poetry. I have all of the McCaffrey Pern books except for one or two of the recent ones by her son. With a favorite author I know I will probably like the work, so I buy the books. Most of the time that works out, so I read it again. Am I missing out on a lot of good books I would probably enjoy? Almost certainly. On the other hand, I really enjoy nearly everything I buy with my limited funds, and get good value by rereading them, usually when another book in the series comes out, but sometimes just for the heck of it. And I do occasionally try something new, that long-discarded copy of Dune notwithstanding. I think there were three Harry Potter books out the night I encountered them for the first time. I read the first five pages or so of Sorcerer's Stone right there in the bookstore, and then bought it. Within a week I had all three titles. Since them I've discovered...um...well, John Scalzi, I suppose. He's one of the few "favorite" writers whose books I pick and choose from rather than buying them all. And I do at least look at books that might be the next big discovery for me personally. So what have I reread lately? Most recently I've reread several books by Patricia C Wrede, who used to write lots of witty and helpful posts on the old AOL sf and fantasy writer's message boards. Some of my books by her date back to the 1970s and early 1980s. Many of them were in boxes, inaccessible for over a decade until we went through boxes this summer. Now I can reread those old titles, which seldom turn up in bookstores, even used. Yeah. I think I'll reread The Harp of Imach Thyssel next. From March: here is a peek in a window of St. Michael and All Angels. 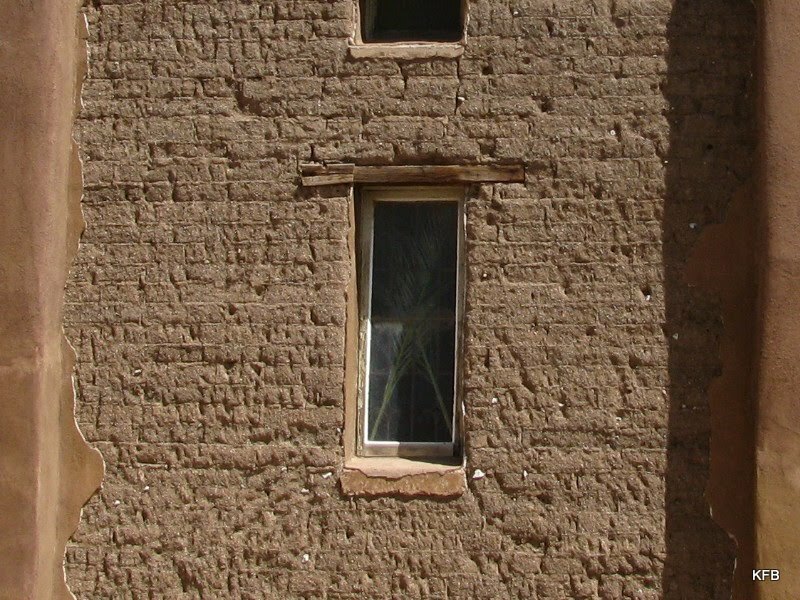 It was around Palm Sunday, and if you look carefully you can see the crossed palms inside the window. 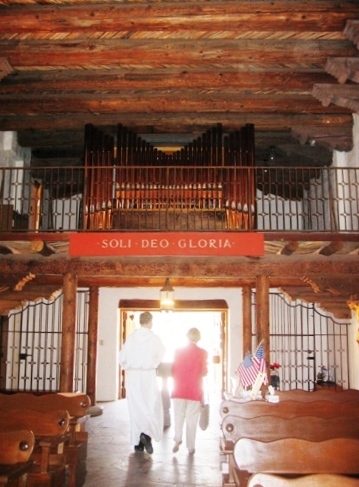 From May: I rushed into the Mission San Xavier del Bac late one afternoon, just before they locked up for the evening. 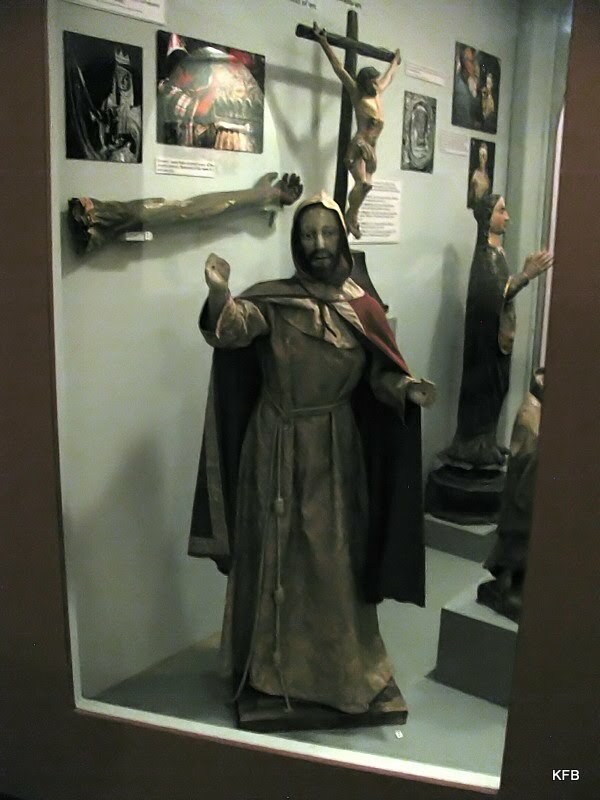 In the museum and gift shop area there was a large display case full of old statuary. I managed to photograph the icons through both the front and side windows of the display. In June I visited the Tucson Botanical Gardens. 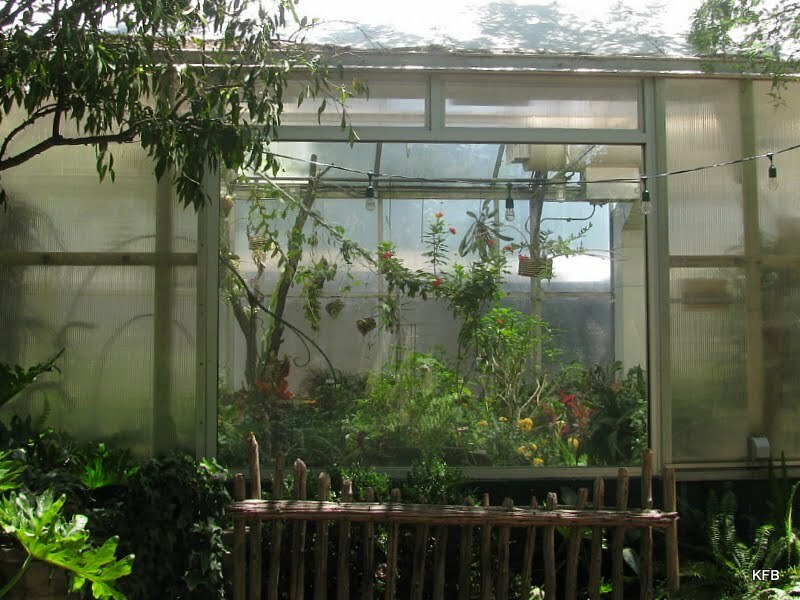 Here's a view in through a window of a greenhouse there. In July a friend was in town for the day, so I met her out at the Arizona Sonora Desert Museum, essentially a desert-themed zoo west of Tucson. 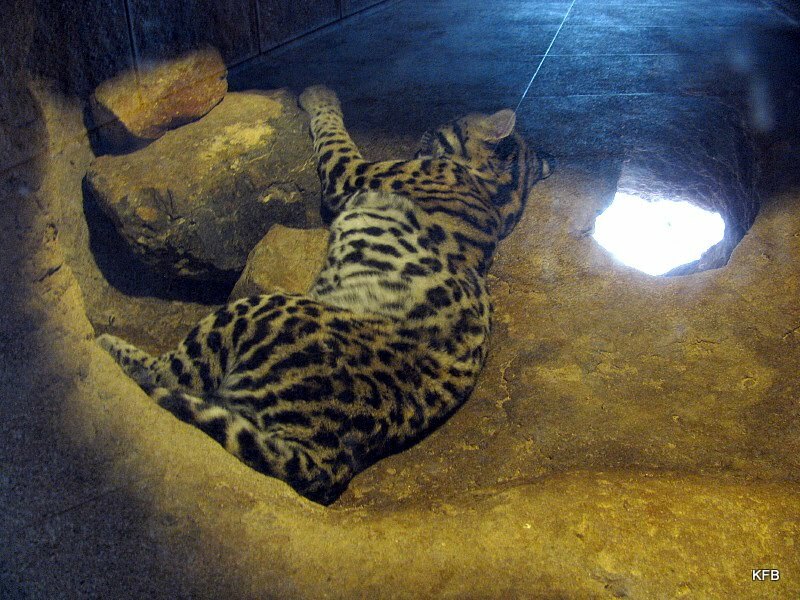 It was a hot, muggy monsoon day, so the animals weren't very active, including this ocelot, seen through a viewing window into its den. 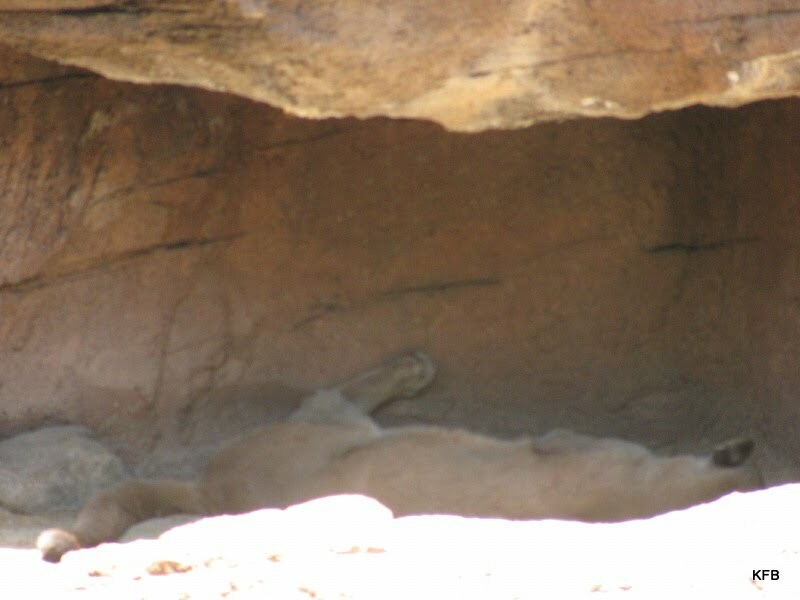 This mountain lion was also sacked out in its windowed den. 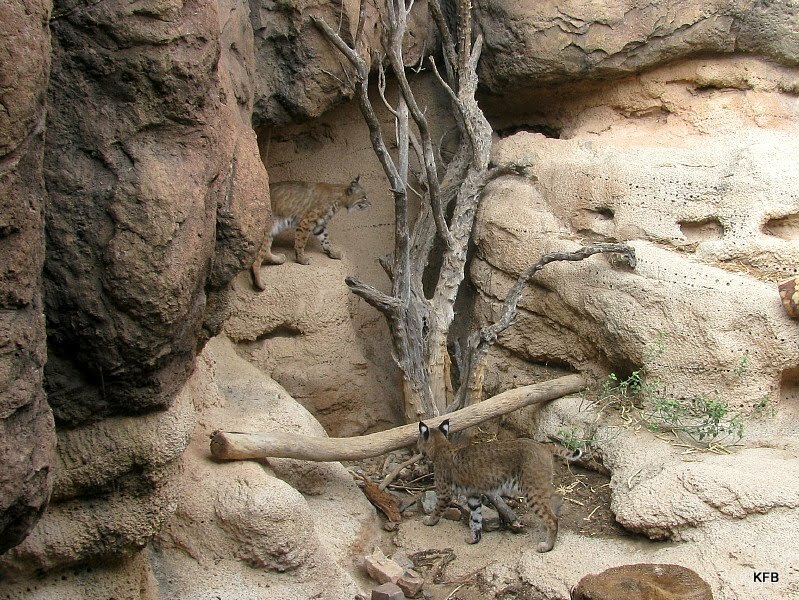 These bobcats are seen here looking through a viewing window into their habitat. That's enough. Now let's peek inside everone else's windows! Rita aka Cashjocky (new blog!) - Posted! Manang Kim, USA - Posted! I almost bought Keith Olbermann's book tonight. His new hardback, Pitchfords and Torches, is a compilation of short pieces (and not-so-short ones) written for and presented on his MSNBC show, Countdown With Keith Olbermann. Today Keith was suspended indefinitely without pay by his boss, MSNBC President Phil Griffin, for making three last-minute campaign contributions last week. NBC News, which oversees MSNBC but not CNBC, has a policy against news staff making campaign contributions without prior permission. MSNBC host Joe Scarborough gave money to a Republican campaign in 2006, but apparently the rule was not in place until 2007. What makes this story kind of freaky for me is that two of the three candidates to which Olbermann contributed the individual maximum amount of $2,400 each are my local Congress people. Our two Southern Arizona members of the House of Representatives, Raul Grijalva and Gabrielle Giffords, were both reelected this week by the skin of their teeth. (Olbermann's other contribution was to Rand Paul's unsuccessful opponent.) 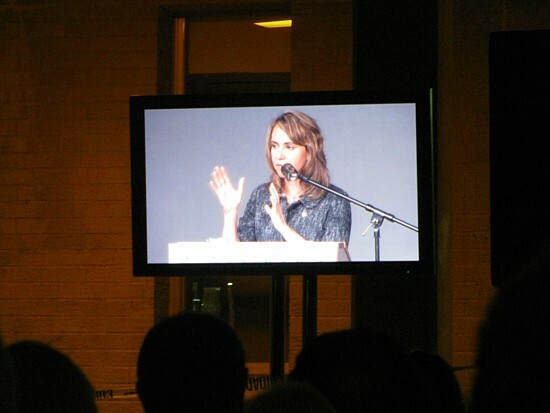 Giffords, whom I heard speak at a heath care town hall, is a blue dog Democrat, a little to the right of me but smart and sensible. I not only voted for her again this year, but also made a small campaign contribution. Raul Grijalva, from Congressional District 7, is the congressman for the other half of Tucson and co-chair of the House Progressive Caucus. I met him once two years ago, and liked him a lot. He's smart and funny and fierce, and although he makes the occasional misstep, I trust him to fight for the same ideals I believe in. Raul got himself in trouble this year by calling for a boycott of Arizona because of the vile SB 1070 our horrible Governor signed into law. 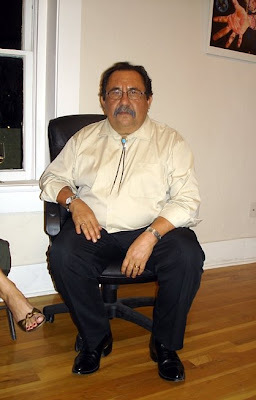 Grijalva later regretted the boycott. Intimidation tactics against him this year have included a bullet through his office window (Giffords got one of those too), an envelope of suspicious white powder and your run-of-the-mill death threats. Don't ever let someone tell you that only Muslims are terrorists, because that is terrorism too. There was also a lot of money poured into the campaign of his opponent, the unfortunately-named Ruth McClung. Gabrielle Giffords, meanwhile, was targeted with hundreds of the most vicious and misleading campaign signs I have ever seen in a political campaign. Both the Giffords and Grjalva races were so tight that even with 100% of precincts counted in this week's election, no one had been declared the winner in either district. Both Democrats were ahead, but not by much. The delay in calling it was due to by-mail early voting ballots hand-delivered to polling places, and also provisional ballots from people who attempted to vote at a given precinct but were not listed in the precinct's voter registration logs. (Basically the Board of Elections has to check whether these folks are registered voters somewhere else, or were accidentally omitted from the lists. If they are legitimately registered to vote in those electoral races, their votes are then counted.) The Associated Press just called the CD7 race for Grijalva on Thursday, if I recall correctly. The reelection of Gabrelle Giffords was just called late Friday afternoon with the release of new numbers by the Secretary of State's office, by which time she was up nearly 4,000 votes. The results still must be certified, but basically they've won - finally. Anyway, Keith happened to have Raul on his show last week, I think for the sixth time. I think Raul managed to sneak the web address of his campaign site into the interview, something Keith has criticized Fox for allowing their guests to do. After the interview and the show, according to reports, Keith discussed the upcoming election and these particular races with a friend, and then privately went to a Mailboxes Etc. (why not online?) and made his contributions. His heart was in the right place, but it was against the rules, as his colleague Rachel Maddow acknowledged on her own show tonight. Rachel also took the time, however, to point out the false equivalence between Olberman's secret donations and the open donations to, endorsements of and campaigning for Republican candidates that goes on at Fox. Okay, so it's not a good idea to base your ethics on the questionable ethics of the other guy. But is the policy Keith violated a good and fair one? If applied across the board to all MSNBC on-air personalities, it's fair enough; if Keith is singled out, not so much. It's certainly not a violation of Keith Olbermann's First Amendment rights, as Keith himself frequently pointed out when others got in trouble for what they said on tv. This is not a case of Congress abridging the freedom of speech, or of the press. This is an employee working for an employer that has certain rules, and the right to enforce those rules. If an employee does not agree with those rules, they can obey them anyway, or try to change the system, or try not to get caught, or go work somewhere else. Keith broke his company's rule, although whether he was aware he was breaking it is somewhat in question. The company has the right to suspend him for that. But should they suspend him, and is it a rule worth having in the first place? I'm on the fence about the suspension itself, as long as it's a fairly short one, just to show that the network enforces its rules and stands on its principles. But I'm not so sure the policy should apply to an MSNBC primetime host in the first place. Keith Olbermann, Rachel Maddow and Ed Schultz are clearly, unabashedly liberals. They make no pretense to the contrary. Chris Mathews and Lawrence O'Donnell are perhaps a tad less so, but they are not shy in airing their opinions, any more than "Morning Joe" Scarborough is shy about offering his right-leaning opinions on the same network. All of their respective shows are steeped in political commentary. That's what they're for. They back up these opinions with actual news reporting, checking facts to a degree that's entirely absent over at Fox. That makes them vaguely journalists, and subject to the NBC News designation. However, a distinction should be made, I feel, between political commentators who also report news, such as Keith and Rachel, and "straight news" reporters and anchors such as Brian Williams et al. 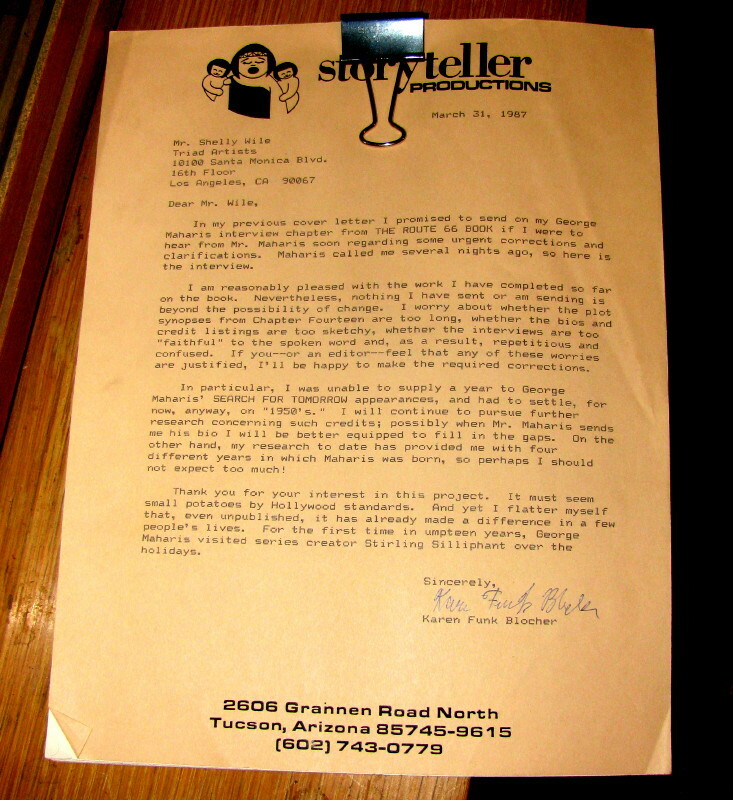 There is no question about Keith reporting a story impartially. He doesn't. He presents the facts along with his opinion about those facts, liberally sprinkled with satire, sarcasm and pop culture references. That's his job, and he's good at it. His career since about 2003 has been predicated on his expressing political opinions. So where is the impropriety in his contributing to a political campaign, privately and without advocating for that candidate on-air? Does this change in the least public perception of his standing as a journalist or the relevance of his political opinions? Not at all. Indeed, I'm surprised that any such rule applies to Keith and his colleagues. It makes no sense to me. What does make sense to me is that on a network that decries the Citizens United ruling that allows corporations to spend millions on political advertising without disclosure, Keith and other paid on-air personalities should disclose their political contributions on air, particularly when interviewing someone whose campaign they support financially or plan to support a few hours later. The interview itself should have no more than one reference to a campaign website, and no call for the viewer to make a contribution. But that's it. Beyond that, the journalist-commentator should be free to make contributions as his or her conscience dictates. As for the current mess, Keith should admit that he screwed up, apologize and be reinstated. Given the paucity of left-leaning media compared with the fact-challenged behemoth of right-wing media, we need as many Keith Olbermanns as we can get. I haven't told you about the book thing yet. Tonight John wanted to cheer himself up with a trip to a local bookstore. Locally-owned new bookstores are all but dead, so the choices were Borders or Barnes and Noble. I have a discount card for B and N so off we went. The first thing that happened when we walked in was me spotting a sign in the cafe for an upcoming appearance by Republican Presidential hopeful Mike Huckabee, right there in the store. This bummed me out, and made John angry. As John went off to check the Peanuts books, I decided to take a look at Keith's new book, and see whether it was something I had to own, or at least buy as a matter of solidarity. I checked the new hardbacks, the bestsellers, and other featured displays in the front of the story and along the center aisle. No Keith. Glenn Beck and a few other right-wingers, yes, but no Pitchforks and Torches. Eventually I asked. It was in the back of the store near the kids' books, in the newly arrived section of the Current Evens rack, in the History section of the store. It wasn't someplace I would think to look for a new book by a major tv political commentator, at least, not as the only place it was shelved. Between that, the Huckabee sign and the fact that B&N only had the Peanuts books John wanted as a two-book boxed set, John was highly displeased with B&N and the whole shopping experience. It hadn't cheered him up one bit. So we went on to Borders. They had three copies of Keith's book in the featured new arrivals display, although when I went back for it someone had childishly turned the book over so Keith's face has not displayed. They also had the Peanuts books, both as the box and separately. I looked over the Olbermann book, and decided I didn't need printed versions of words I'd already heard him speak on air. But we bought the Peanuts books. At the register, I converted my Borders Rewards card to an upgraded version that gave me the same 10% off on the Peanuts books that I would have gotten down the street. I probably won't be going to Barnes and Noble again. Not for a while, anyway. Weekend Assignment # 341: How Do You Do Halloween? Each year at this time, we are told that Halloween is second only to Christmas in its commercial impact. Once an amalgam of religious holidays, it has grown over the years, at least in the U.S., and it's not just for children as it may have been half a century ago. What, if anything, do you personally do to celebrate Halloween? Have you ever participated in an alternative or related holiday, such as the Dias de Los Muertos, Samhain, a church Harvest Festival, etc.? Extra Credit: What was the last Halloween costume you wore, and when? It's no secret that I'm a big fan of Halloween. Most years, I try to do something amazing by way of themed Halloween decor outside our front door, and dress up in different (albeit rotating) costumes ear year. 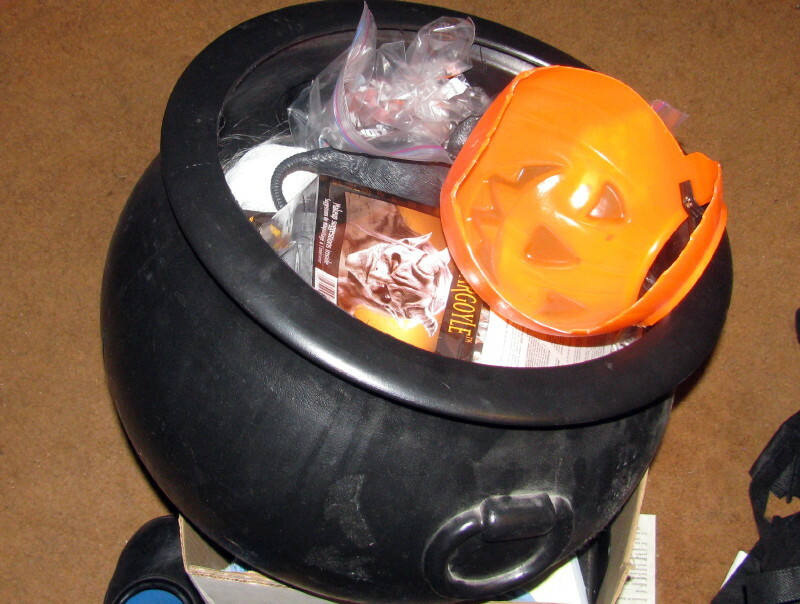 I also hand out what are probably the best treats in the neighborhood - multiple pieces of candy plus little toys such as spider rings and baseball cards and fake pirate gold. John is with me in principle, and helps to find toys for the little bags I prepare. Kazoos and glow in the dark lizards, glittery pencils and balloons and jumping spiders were all among this year's offerings. Sometimes he'll carve a jack-o-lantern for me, if we do one at all instead of relying on our reusable electric ones. Occasionally he'll help me string a light, or will play a sound effect on his computer as kids approach. Generally, though, I'm the one who does 90% of the work. I don't mind, exactly, but I'm often frustrated that my efforts nearly always fall short of my aspirations. This year's Halloween was especially difficult. John has been working seven day weeks to make up for my severe underemployment, so he wasn't around on Sunday to help me set up. Even if he had been, we both knew it would be foolish to spend money on more Halloween decor to add to what we already have from past years. What we had on hand was what I had to work with. But I had a plan. In going through boxes to get rid of stuff we don't need, mostly by donating it to the rummage, book and collectibles sales at St. Michael's English Faire, I'd come across some old curtains of John's. They date back to before I met him, and I don't think I've ever seen them hanging; but I love them anyway. They are black velvet with red braided trim, very Gothic and occult. So the plan was, I would dig out these curtains and hang them at the end of the alcove outside our front door. I would thus be concealed inside the alcove, hiding behind the curtains like the Phantom of Calle Mumble. 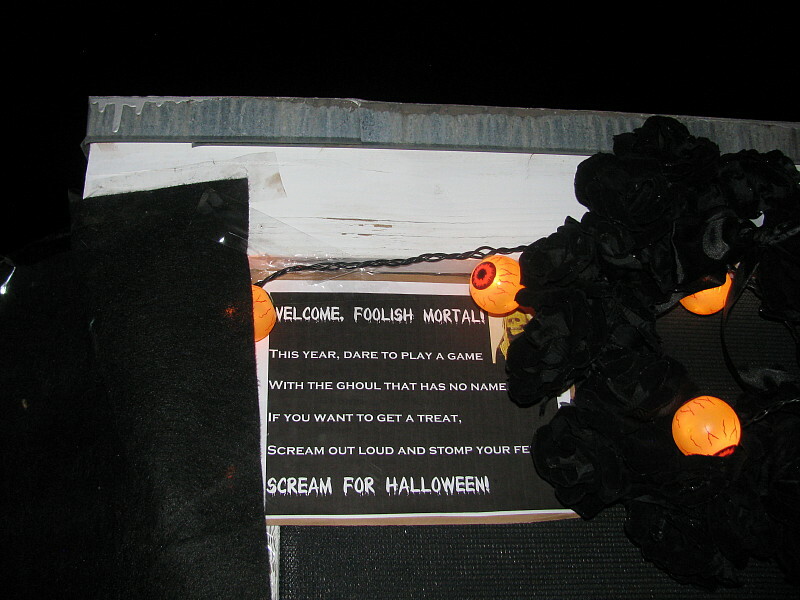 When kids came by, I would reach through the curtain with one monstrous hand, and give them their treat bag. I had skeleton gloves and I think werewolf gloves I could use. Or maybe I would just paint my hands a ghostly white. With the ghoul that has no name. Scream out loud and stomp your feet! I printed out my poem and posted it on the alcove wall, but it was hard to do so in such a way that all the words were visible. It doesn't matter, though. I think only one person read the sign all night. And the black curtains refused to turn up again, however hard I searched. And anyway, how was I to hang them? Buy a curtain rod? Drive nails into the flimsy walls and hang a rope? Reluctantly, I decided to buy either cheap beaded curtains or crepe paper streamer curtains. When I couldn't find those, I settled for Mylar fringe, which blew in the wind and started to tear apart before they were even hung. Two three-footers were barely adequate to cover half of the width I needed, doubled up. 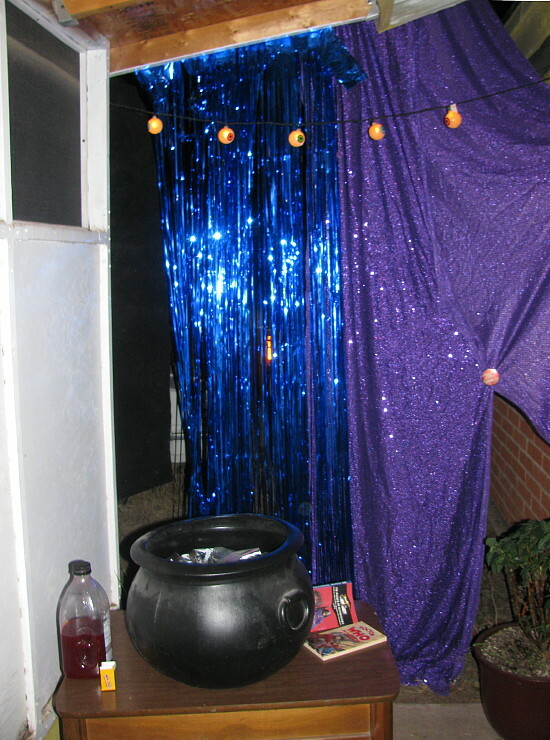 For the other half, I used glittery purple fabric I bought years ago for a wizard costume I never made. To hang it I simply folded it once and wrapped it around a board that I managed to shove onto the roof. It wasn't the most successful decor ever; in fact it was decidedly shoddy. But like Linus's pumpkin patch, it was sincere. I spent three and a half hours out there, putting together treat bags and handing them out, and reading Doctor Who books in between. At least one box of Halloween stuff didn't turn up, so I didn't have my ghoul mask or my werewolf/sort-of-tengrem mask or the hairy bulging eye one, or any monster gloves. So I settled for my fringed black shawl and no mask or makeup at all. I just shoved my hand through the fringe curtain, treat bag and all. The battery was dead on my old laptop and my DVD player was at church, so I didn't have music or sound effects. The effect was considerably less spooky than I had hoped! The good news was that the Assembly of God church across Wilmot from us didn't have their Harvest Festival to compete with Halloween this year. That meant that we had a decent turnout, including quite a few kids arriving by car from other neighborhoods. Last year I made a wizard's study, wore the purple cloth as a cape and put on a wizard's beard, or possibly the one mask that I did manage to find this year but did not wear. I had real occult books and fake potions. And by the way, I injured my shoulder tripping as I carried my chair outside. Another year I had a spooky forest, with spiders and snakes as well as my squeaky plastic rats. There was a year in which I made and wore a Tiki mask to go with the two Tikis we still have on display out there. Still another year we had a Styrofoam graveyard, and twice we had Black Rose Kate come to visit, pirate flag and all. But this year was our make-do Halloween, and I think I'm the only one who was really disappointed. 65 kids still got their bounteous bag of treats, which they dropped in their bags with out without a "Thank you," and probably never knew which house was the one that was extra-generous. That's all right. Next year will be different. Next year I'll really show 'em a Halloween house! Aside from certain music and some minimal celebration of All Souls' Day, this is what Halloween is to me. Wheeler School: my favorite polling station. As has been noted by the New York Times and elsewhere, many Americans have no idea that Obama and Congress have cut taxes. Most tea partiers simply assume that the "tax and spend Democrats" have raised their taxes. Plus the supposed "Obama tax hike" looms on the horizon, which is actually the built-in expiration of a tax cut instituted early in the Bush administration. President Obama wants to extend these to all but the richest 2% of Americans, who would still get a tax cut on part of their income but not to the extent that their getting it now. This "tax cut for the rich" translates to an increase of "$36 billion to the federal deficit next year" compared to the Democrats' plan," according to the Washington Post. That's more than can feasibly be made up by cutting spending on trivialities like education, safe food and drugs, safe mines and oil rigs, a cleaner environment or unemployment benefits. Check out the graphic - is this the fiscal discipline you're looking for? Place the government in the hands of a secret Muslim terrorist born in Kenya. For the birthers to be right, not only do the many people who have examined the actual Hawaii birth certificate have to be lying, but someone has to have had the foresight to place fake birth announcements in two Honolulu newspapers when the baby with the funny name was born.In addition to this, Obama has a long, well-documented history of regular church attendance. If he were a terrorist, wouldn't we have seen some evidence of this in the past two years? Heck, he hasn't even managed to close Guantanamo! Take away your guns. Putting aside the fact that not everyone owns a gun or wants one, this threat seems entirely empty. Although the NRA sent out mailers making this claim, and many people still believe it today, Obama's stated position is quite different. According to his 2008 position papers, as reprinted on FactCheck.org, "Barack Obama believes the Second Amendment creates an individual right, and he respects the constitutional rights of Americans to bear arms. He will protect the rights of hunters and other law-abiding Americans to purchase, own, transport, and use guns." He is, however, in favor of "commonsense measures that respect the Second Amendment rights of gun owners, while keeping guns away from children and from criminals who shouldn't have them. They support closing the gun show loophole and making guns in this country childproof. They also support making the expired federal Assault Weapons Ban permanent, as such weapons belong on foreign battlefields and not on our streets." This is a far cray from the NRA claims that Obama wants to "ban use of firearms for home self defense" and "ban the manufacture, sale and possession of handguns." So much for the claims. The reality? In two years of legislation by the mostly-Democratic Congress under Obama's leadership, no attempt has been made to take away the average person's guns. Almost nothing appears of a list of active legislation in the Senate, and what has passed has been mostly gun-friendly, as an article in The Hill points out: "Quigley noted the 111th Congress has not debated closing the gun-show loophole or reauthorizing the assault weapons ban, which Obama promised to pursue on the presidential campaign trail. Instead, Democrats have passed gun-rights measures, including the “Protecting Gun Owners in Bankruptcy Act of 2010” and legislation that would allow guns in national parks and on Amtrak trains." Indoctrinate your children in school. Although the federal government does help to fund children's education, what this comprises is determined at the levels of the state and local school board, leading to frequent battles over the teaching of evolution, book bannings and the content of textbooks. When Present Obama addressed schoolchildren on a national basis for the first time, right-wingers fearfully kept their children him to protect them from the harmful effects of hearing what the President of the United States wanted to tell them. Obama's insidious message: stay in school and work hard. Shocking! Institute Sharia Law. Never happened. Never attempted. Steal elections with massive voter fraud. The Republican nominee in my Congressional district, Jesse Kelly, made a spurious claim last week that people are bused in from Mexico to commit voter fraud on behalf of Democrats. 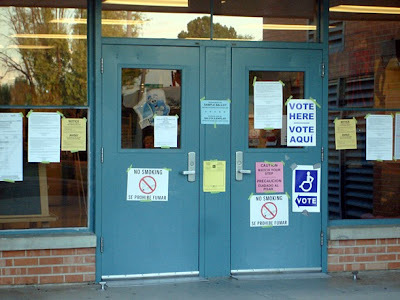 Aside from the small problem that they would have to already be registered to vote in the precinct and be able to show idea, there's the fact that it simply has not happened, according to Arizona's Republican Secretary of State, who called such rumors "a kind of urban legend": "As Arizona’s chief elections official, I take seriously any allegations of fraud in our election process. As soon as these accusations came to light, we got in contact with elections officials in Yuma County and across Arizona to determine if a fraudulent scheme was afoot. With our initial inquiry complete, I’m happy to report that these latest allegations of rampant registration fraud are without merit." Part and parcel with this local story are similar claims about ACORN (which not longer exists thanks to scapegoating and an entirely deceptive videotape) The New Black Panthers (just a couple of guys, apparently) and "at risk" districts which just happen to be populated by minorities and others likely to vote Democratic. At what point does poll-watching become intimidation? We may find out tomorrow, as Tea Party poll-watchers look for people they can accuse of voter fraud. Actual voter fraud cases, by the way, are exceedingly rare. Institute Death Panels to determine whether Grandma must die. The actual passage in the health care reform bill said simply that if you want to consult your doctor before making your own end-of-life decisions (i.e. a "living will"), insurance should cover the office visit. Ooh, scary! Put you in jail for not buying health insurance. There never was any such provision in any of the health care reform bills. Take away your freedom. Are you less free than two years ago? People have openly carried firearms at political rallies, shouted slurs at members of Congress and spat on them, and carried signs depicting Obama as Hitler, the Joker or a tribesman with a bone through the nose. Nobody's been taken to an internment or reeducation camp, or even prosecuted for such things. Much of the argument on the Republican/Tea Party side this year is based on fear-mongering, trying to convince you that Obama is a scary foreigner who wants to hurt you, or at least cost you money, and that Muslims and Mexicans are all out to get you. The vast majority of the claims made, against them and against your particular Democratic candidate, are distortions and fabrications. Meanwhile, many of the Republican contenders are the most extreme they've been in decades, looking to privatize or "personalize" or even end Social Security, close down the EPA, resist food safety regulation (you have a personal taster, don't you?) and protect the Constitution by getting rid of amendments they don't like, such as the one that lets you vote for your Senator. Much of the Republican money machine this year is bankrolled by billionaires and corporate fat cats who know that Republicans will support their interests over those of the average person, and by the U.S. Chamber of Commerce, which takes millions in contributions from foreign and domestic corporations that outsource jobs as much as they possibly can. These folks want to scare you into voting against your own interests: your own safety, your own freedom, your own financial well-being. They want to convince you to value greed over fairness, "us" over "them," fear over facts. 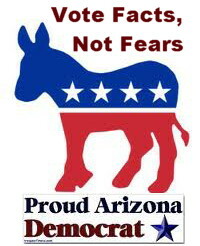 Don't let fear and greed rule this election at the nation's expense. Vote Democrat.